Four Axis Lead edge Feeder System. Skip Feeding Setting Available,Can produce Large Size Boxes. Apply Expansion Sets Tight Links,Long years Using with precise printing. Colorful Touch screen Input,Auto "Zero",reposition,Save Time and Boards. Powerful Main Phneumatic Cylinder Lock, make sure machine stable running. Self-Protection system,Machine only running after all sections locked well. Storage with 1200orders data base. 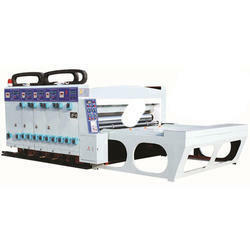 Model double color printing, slitting and creasing machine parameter requirement. Semi-automatic chain-feeding, each unit electrically separates and combines, pneumatic locking, relax, alarm, lights prompt. Printing press roller outer diameter 124 mm, the surface is grinded, plated hard chrome, balanced corrected and run steady. printing gap is adjusted by the cross slide and range 0 ~ 12 mm. Pressing line roller 85 mm, hard chrome plating after surface grinding, the upper and lower pressing line roller 152 mm and the surface is plated hard chromium. Three blades 4 lines, Pressing line wheel is adjusted by the cross slide and the range 0 ~ 12 mm pre- roll. Self-absorbing ink, the mesh roller provide automatically cycle ink, Surface is not dry when host paused, automatic cleaning, auto-cleaning anilox roller. Dual doctor blades system: perfect spot print. Change box height to be an easy operation. Independent engine drive controlled by KEB servo system from Germany to ensure the die cutting precision. Memory system for easy operation and maintenance. (This system can help to remember position of printing cylinder when operator stop the machine and open it to adjustment on printing plate. After finishing adjustment and close the machine sections, people can use this system to make printing cylinder return to the former position (before stop and open sections). 7.0 inch touchscreen on the printing unit,The printing register is computerized control. The printing cylinder is motorized and computerized moved axially(±5mm). Ink alarm system, the buzzer sounds when the printing unit be lack of ink. Mounting plate system to save the changing plate time. foot switch is used to turn the printing cylinder when mounting the printing plate. The anilox roll lift up and separate from the printing plate automatically when sheets are not feeded. And the anilox roll keep running when lifted up to prevent the ink from drying. Self-locking and fast move of the feeding wheels on printing unit.no need to fix the feeding wheels by screws. A emergency stop is adopted to assure the operator’s safety when operating between the machine units. The gear position is locked when the machine unit open and closed. 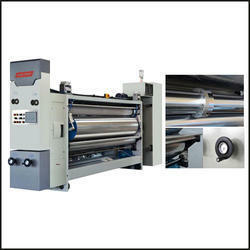 We are prominent names in the industry in offering a wide range of Flexo Printer Slotter Die Cutting. Lead edge feeder, stable and accurate. Upper feeding roller is rubber roller with suspension design,feeding pressure is air cylinder adjusting, protecting the corrugated board from damaging during transmitting.The lower feeding roller is coated by ceramic material with rough surface to prolong using life and enhance friction force. Dust removal device: the cleaning brush and the suction fan can clean the dust on surface of corrugated board to improve the printing quality. Side baffle is motorized control. Flapping device to make the sheet pile in good shape. All parameters can be showed and adjusted in the main touchscreen. The phase of each unit, box length,width and height can be setted in the main touchscreen. Memory system: Production orders can be saved and recalled to save changing time. 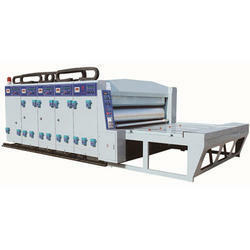 We are suppliers of 2 Color Printer Slotter With Leadedge Feeder Model SMYKM. 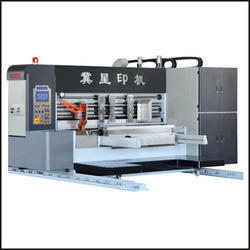 Single shaft double knives slotter, 7.0-inch touchscreen on the slotter, box length and width are motorized adjustment. Box height is controlled by PLC and can be stored in the computer, saving the changing time in future. The up knife, bottom knife, pre-creaser and creaser are synchronously moved. The precision linear slideway can ensure the flexible and stable of moving. The up creaser wheel is covered by rubber anvil to protect the corrugated board from damage. 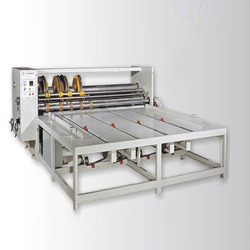 Flexible corner cutting knife can cut 3, 5 and 7 layer corrugated board without adjustment. Easy to operate. Control system: Siemens PLC, production order can be saved and recalled to save changing time. Memorize system for easy operation and maintenance. Double servo feeding system,each row of feeding wheels is driven by independent servo motor, high precision and low noise, no feeding rollers in feeder to prevent the corrugated wave from damaging. Printing: Doctor blade inking system?? ?high printing quality easy washing ink saving. Slotter: computerized set the box length, width and box height, fast and convenient. Die cutter: independent engine drive controlled by KEB servo system from Germany to ensure the die cutting accuracy. Surface speed compensation system. Die cylinder shifts when running to prolong the life of rubber anvil. Gears are made of high-quality chrome steel, heat treated and grinded to ensure the high stability and precision. Bearings and electrical components are all famous brand in Taiwan and in China. 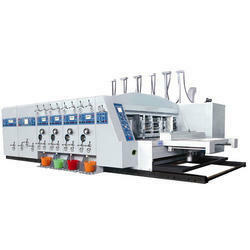 Vacuum feeder, stable and accurate. Upper feeding roller is rubber roller with suspension design,feeding pressure is air cylinder adjusting, protecting the corrugated board from damaging during transmitting. 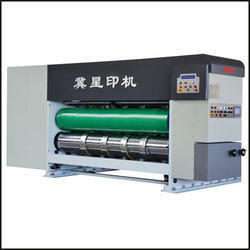 Printing: Adopt famous brand anilox roll and rubber roll to ensure high-quality printing.doctor blade system is optional. Ink fast collecting system for saving ink,Automatic washing of anilox roller,connect the machine to user's warter supply,automaticly wash until anilox roller is cleaned well,washing time can be set in time relay. Automatic Slotter: The box length, width and box height are computerized setting,fast and convenient.the creasing wheel is coated with rubber to protect the board from damage. The material of the body is HT250, after artificial treatment,Thickness of body is 40mm, making by CNC machine, with high Strength and high precision. 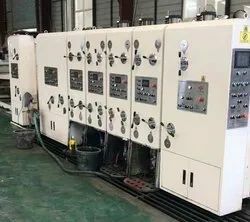 All the transmission gear is spiral gear, materials is 45# steel, afterHarding treatment, and adopt automatic circle lubrication, with low Noise, high precision and long use life. Bearing adopt the famous brand in China like Luoyang, Wafangdian and HaerbinThe electric contactor adopt Telemecanique brand. The rubber roller adopt Jizhou Chunfeng Yinxing rubber Roller, famous brand in China, hardness is 65HRC. Machine Details1.The leading edge of the wheel Three axis feeding system With Dust Suction System.Applied VFD (Variable Frequency Drives) Control Suction Volume Due To Different Boards’ Size And Also Suitable For bent Boards. 2.Main Motor With Frequency Control Servo Motor which is much Faster And Precise Also With Start Delay Protection Function.3.With Newest Double Screws For the Slotting Unit Adjustment, Avoid the Slotting Cutter Holder Stuck With The Axis.Softy and smoothly Adjustment, also much Precise(Our Patent Design).4.Servo Motor Speed Compensation System To Keep Anvil Roll Speed Always The same With Die Cutting Roller.To Ensure Die Cutting Accuracy. Compensation Ranges ±3mm For Normal Corrugated boards.5.All Units Use Expansion Sets Tight Link To Reduce abrasion of the shaft.To keep precision of the Machine for long years.6. All Gears with Alloy Steel Carton Treatment¿¿¿Precision Grinded 40Cr Alloy .Hardness 60-63 Degree.7. Whole Machine Equipped with High-precision Ball Lead screw Which Make Sure the adjustment more precise and also durable.8. Anilox Roller With Fast Roller Shaft Structure, which can quick Change the Chamber Doctor Blades Instead Of Normal Rubber Roller. Much Convenient and Flexible for Users.9.Boards Guide Wheels can Fast Adjust with Fast Lock and unlock design, save time.10.Main Motor With Start Delay Protection Function. If Not All the Units Locked Well,the Main Motor Will Not Work. 5. Electrical Automatic Control System Features; 1. More than 95percent of the electrical Elements are International Famous Brand. The Control Center use the Servo CNC positioning technology, there are Color Touch Screen And Memory Parameters in the Paper-Feeding part, the printing part, the Slotting Part. When you stopped the machine when producing products, such as clean the Printing rubber/Studio, when you close the units again, and the data you had already set will be reset automatically and you do not need set again, it saves time and papers.2. With1000+Orders Saved Memory Storage. With Computer Control,Save Order Date, Fast Order Shaft and also easier operate.3. With Ink Shortage Alarm Device, Ink Shortage, Stop Feeding.4. Use Central Control Computer, To achieve remote diagnosis and maintenance. Save cost and time. 5. All units use Pneumatic lock, electricity apart, the feeding wheels will stop when apart the machine to make sure the printing accuracy next time.6. With Europe and America Design concept, Passed Europe CE Certificate Verification. 1. Touch screen controls in each moveable unit with PLC. And be able to interconnect with integrated computer. All function operation and order setting are available with digital display. 2. Integrated drive and safety protection device is used for pneumatic interlocking over each unit. 3. All transmission gears are carburized and quenched with precisely ground. When machine running, every corner of gears are lubricated by the recycle sprayer. 4 All core components are from international top brand. 5. 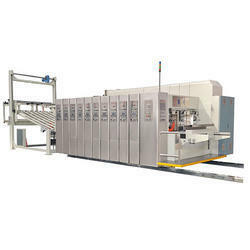 In-line control of flexo printer combined with folder gluer. Integral order management and quick shift function are available. 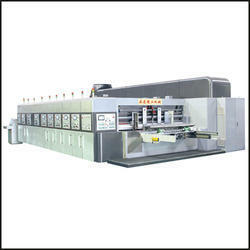 It made the significant revolution for completely automatic production line in packaging field. 3. Sheet cleaning system includes upper suction motor and brusher. On-Off. For safety an audible alarm sounds while the units moving. 5. Frequency control of main motor, and there is a protective device for main motor running. (the machine can't run when the units are not locked). 6. Pneumatic brake device is attached on the driving shafts to avoid machine damage while there is a faulty operation. 11. Frequency converter controls the air volume of suction. And correctly adjusted by sectional knob. 12. The volume and pressure are manually controlled to match different sizes of paperboard. 13. The side guides (right-left movement) are motorizedBack stop (descending ascending) is manual, Back stop (front/back) is motorized. Front guide is manual. 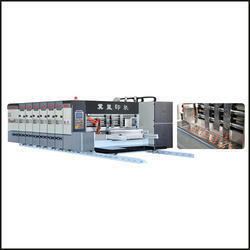 Chain Feeder 2/3/4 color Flexo Carton Printing Die Cutting Machine color printing and die cutting machine technical information. The upper feeding axis 85 mm, outer diameter is 113 mm, the down feeding axis 124 mm, the surface is plated hard chromium. the feeding gap is adjusted by cross slide 0~ 12 mm. Printing press roller outer diameter 124 mm, surface is grinded, plated hard chrome, balanced corrected and run steady. Printing gap is adjusted by cross slide and range 0~ 12 mm. pressing line roller 85 mm, hard chrome plating after surface grinding, the upper and lower pressing line roller 152 mm and surface is plated hard chromium. 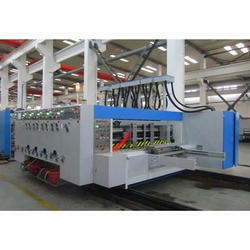 Pressing line wheel is adjusted by cross slide and the range 0 ~ 12 mm. Die cutting unit slotting) Die cutting roller outer diameter 410 mm, rubber pad roller outer diameter 388.9 mm, hard chrome plating after surface grinding, Static and dynamic balance correction, good operating stability. Automatic separate oneself from cutting die device, in order to protect the rubber pad, prolong the service life of rubber pad. Rubber roller is equipped with a mechanical cam type transverse 58 mm floating device, prolong the service life of rubber pad. Phase adjustment device, can realize the digital electric adjustment of 360 degrees, die-cutting roller transverse moving device, the whole distance is 15 mm. 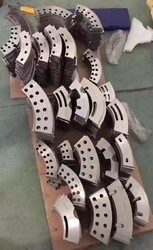 Differential compensating device, that can control the line speed on the surface of the rubber pad roller, (in the using process, rubber pad diameter becomes smaller) compensation device can make line speed of the rubber pad roller completely control by the knife mold ,thus the die-cutting carton, carton box and knife mold shape are identical. 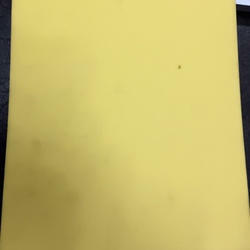 Rubber pad grinding device, that can design a number when work for die cutting, that can start up the rubber roller motor when need grinding pad, (host machine is open) for grinding, can make the rubber pad used repeatedly, improves the pad use rate, reduces the die-cutting pressure and reduces greatly the wear of the other parts and bearings. Slotting roller is equipped with slotting device, synchronize manually adjust the height of the box, manual move the knife(adjust the length, width of the box). slot Knife width is 7 mm, cutting edge width is 50 mm, that can save the customer's cost of die plate. Harbin bearing, wafangdian bearing, zhengtai electric. 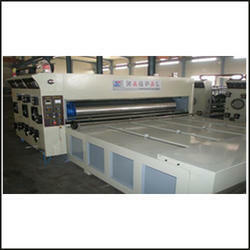 We are actively involved in offering an excellent range of Printer Slotter Die Cutter. These presented slotters are hugely treasured and cherished because to their remarkable functionality and exceptional built. The machine and the worktable are installed integrally. 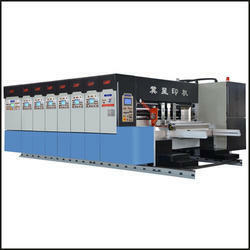 We are offering a wide range of Used Dongfang ,jingchang, dinglong,chochang,shengli,flexo printer slotter die cutting. 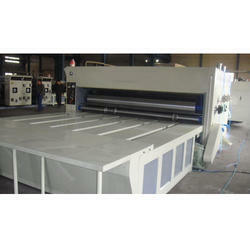 Cushion for screen printing or Flexo Printing Screen R Back used for easy setting of stereo on the machine. 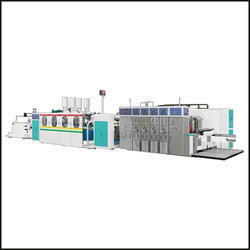 Looking for Auto Flexo Printing Slotting Die cutting Machine ?